It was a funny, disjointed sort of a day today. One we would have liked to take slowly, pausing to enjoy and celebrate. Instead it was filled with markets and gigs and three year olds who vow to never sleep... Still we managed the main bits in a low-key sort of a way. Yep. 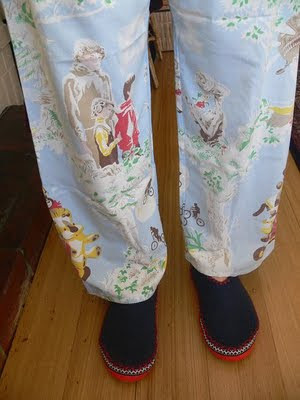 Cotton pyjamas. With ET on them. Made from bed sheets thrifted from the Tip Shop. Perfect. They have matching hankies too. The Austrian Slippers are replacements for the 4yo pair that have just worn through. Apparently they are the best slippers ever. Cake? Well we were short on time and full of fish and chips, so this year a plate of chocolate covered raspberries were just fine. 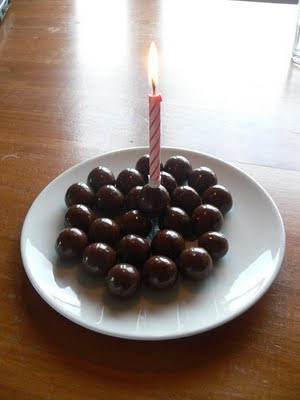 Oh that would do for my birthday cake! Cute! I'm green over those pj's, very cool indeed!